Another of Long Island’s Gold Coast Mansions...this one located on the grounds of Old Westbury Gardens in Nassau County, New York. All of these wonderful estates are great places to take wedding photographs. My favorites include: The Glen Cove Mansion, the deSeversky Mansion and Conference Center on the grounds of NYIT; The Royalton at Roslyn Country Club, Mill Neck Manor; The Bourne Mansion In Sayville and Oheka Castle in Huntington, NY. 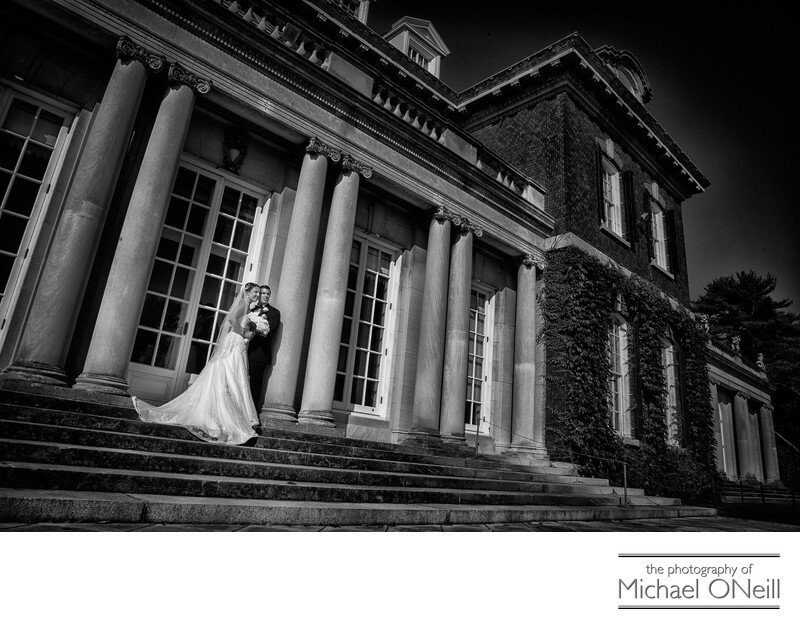 The architecture at all of these stately mansions lends itself to elegant wedding photography. As the bride and groom stand on the steps leading up to this magnificent mansion they look out across a sprawling, manicured lawn and dozens of acres of beautiful gardens and ponds. When I get the opportunity to create beautiful wedding photos at Old Westbury Gardens I make the most of it. We wind up walking around the entire property to take advantage of all of the wonderful spots: The gardens with the wrought Iron gazebo located on a private pond; The west stairs down from the mansion overlooking yet another pond; The arches and columns by the reflecting pool; and of course the mansion itself. Inside the mansion there are numerous locations for exquisite wedding pictures so you have nothing to worry about if you have inclement weather on your big day. If you are looking for a wedding photographer who has extensive experience working at all of Long Island’s mansions give me a shout at my East Northport, NY studio and gallery.